House of the Dead: Overkill has had 31,591 players report play-time data on the Nintendo Channel, since the game released in February. The Conduit was released in June, and has had 46,377 players report play-time data on the Nintendo Channel. 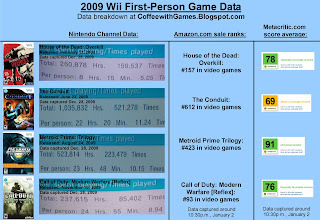 Metroid Prime: Trilogy has had 22,017 players report their data, since the game released in August. Call of Duty: Modern Warfare [Reflex] was released just in November and has 9,552 players report data on the Nintendo Channel. Starting this week, I'll show Amazon.com's position for the games and the current selling price, because Amazon.com is usually below the MRSP just a little. House of the Dead: Overkill's Amazon.com sale rank is #157, and is selling for $16.77. The Conduit's sale ranked is #612, and is selling for $27.99. Metroid Prime: Trilogy is ranked #423, and is selling for $41.90 from Amazon.com 2nd Party/3rd Party Sellers, because Amazon.com doesn't have Metroid Prime: Trilogy in stock. Call of Duty: Modern Warfare [Reflex] is ranked #93, with a selling price of $46.99. Call of Duty: Modern Warfare [Reflex], again, saw the largest increase in players reporting data on the Nintendo Channel. Metroid Prime: Trilogy, for some reason, still isn't in stock on Amazon.com, and it's only available from 2nd or 3rd party vendors. I emailed Nintendo about this a few weeks back, but still haven't received a reply. House of the Dead: Overkill had 767 more players reporting data this week, than last week. The Conduit had 1,316 more players reporting data this week. Metroid Prime: Trilogy had 1,309 more players reporting data this week. Call of Duty: Modern Warfare [Reflex] gained 2,082 more players reporting data in the last week. Did anybody receive any of these games for Christmas (or other holidays you may celebrate)? Nintendo Channel data captured after the Nintendo Channel updated on Monday, December 28, 2009. Numbers of players reporting data are rounded down to the nearest whole number. I am glad to see that CoD:MWR is gaining players. Its by far one of the best games on the Wii right now. I know I snagged my copy when Amazon had it on sale for around $35 and I was extremely pleased. I wonder how many people have this game but do not report their activity on the Nintendo channel. @NintendoGamer - I know that's something important that hinders the real results of the gameplay data, when someone doesn't report their data. But I guess we do the best we can with what we got. I want to get Metroid Prime Trilogy. I need to get better at the Wii controls lol. Yea, the only thing to base the numbers off of, would be the "reported" sales of the game, compared to the number of users reporting data. I still haven't picked up COD:MWR, but it is on the top of my Wii games list now. From your own experience opening the Wii and setting it up, I can see why the majority of users don't submit their data, probably because they don't even know the channel and option exists. As for you wanting Metroid Prime Trilogy, I'm thinking Nintendo may be phasing the game out already, because Amazon.com hasn't had the game in stock in a long while, and I don't know why BestBuy had it for $20...perhaps to help clear inventory?